Need help with your bin collection? Not sure which bin to put your waste in? Do you forget to leave your bin/boxes out for collection? Need to find a recycling centre of bring bank? 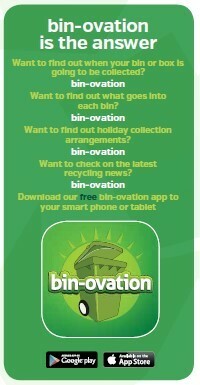 Download the free Bin-ovation app to get instant access to all the information you need about bin collections and recycling centres in your area. The App is a simple and easy to use tool for householders designed to help residents of the borough. The App has a host of features to make your recycling efforts as easy as possible. Download the free Bin-Ovation App from the Google Play Store or Apple App store.